Upstate House magazine interviewed me a couple of weeks ago. We discussed the blog, my cookbook, and the 190-year-old house that I share with a beagle, two cats, and a Silver Fox. The Silver Fox in question? My spouse. Of particular interest to the magazine’s free-lance writer, Niva Dorell, was the Music Room. Why? 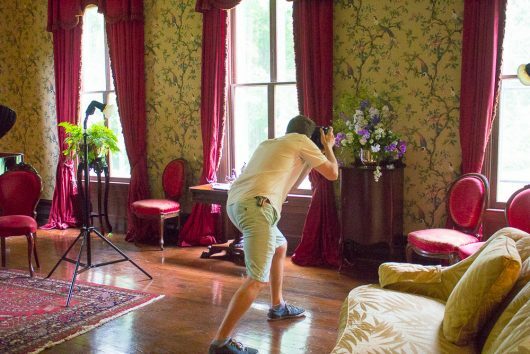 Well, because several years ago, this very ornate, very Victorian wing of the house — it was built as a double parlor — was in danger of collapsing. Niva felt the restoration of the room would make a good “hook” for the article. Upstate House scheduled a photo-shoot for Tuesday, June 28. Consequently, on Monday I dropped $114.00 on fresh, locally-grown cut flowers. These were turned into Victorian-type displays by Sue Chiafullo. Sue is a dear friend and a masterful floral arranger. She produced three lavish subjects for the music room, and one for the entrance hall. We both felt confident that the flowers would be fresh and wonderful when the photographer arrived the following morning. About five minutes after Sue finished her arranging-job, I received an email from the photographer. She was ill, and had to cancel the shoot until the following week. I wished her a speedy recovery. And then I cringed, because…well, I’d spent $114.00 on flowers, and Sue had gone to the trouble of arranging them. With a certain degree of guilt, I wrote to the magazine and asked if they could possibly find another photographer to manage the shoot. And to my surprise and delight, they delivered! Say hello to Jesse Turnquist, photographer extraordinaire! Jesse set up special lights, and proceeded to take about 100 photos of the room. Far more challenging were the photographs that Jesse took of me. Honestly, I could hear his camera’s shutter shudder. Entrance Hall. 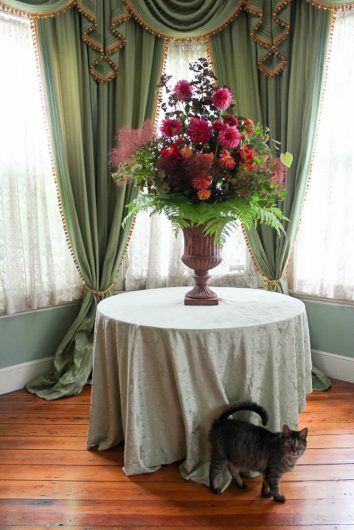 For the cast-iron urn that sits on my green-draped table, Sue arranged branches of smoke bush (hint: try using this feathery Cotinus in your own arrangements), plus Physocarpus, tall dahlias in shades of red and vermillion, and chocolate-red roses. I added ferns to the base of the sculpture. Rearranging the tablecloth is Camille the Curious Cat. Music Room. 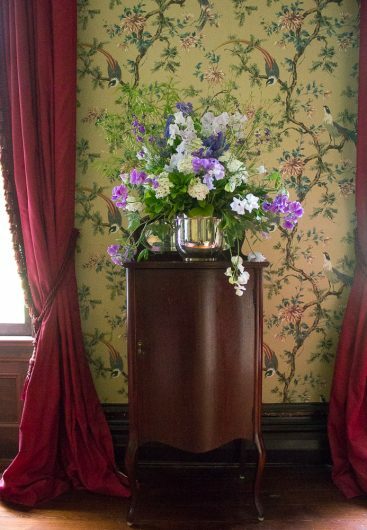 Arranged in a silver ice bucket, and placed on a Victorian music cabinet, are sweet peas in white, purple, and lavendar. Asparagus fronds, clipped from my kitchen garden, provide an airy green background. How I wish you could smell this display. Sweet peas are so-named for their gorgeous perfume. Music Room Mantel. 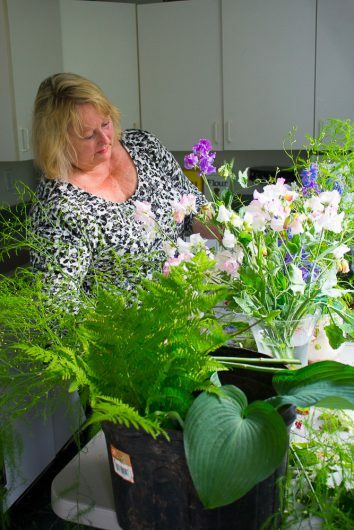 Here, Sue created two matching displays of sweet peas and blue Larkspur. Hosta leaves from my garden provide bright green contrast. Parlor. Sue didn’t use the big bunch of Saponaria that was included in my flower purchase. Thus I stuck the pink lot in a white pitcher, and placed it on a Federal table in the green-and-cream parlor. The flowers really brighten the room! Enjoy this feature? Get my email updates. And don’t forget to post a comment in the “comments” field below! How gorgeous, perfectly inspirational, and somehow cooling to look at on a very hot day! I love your blog!!! Mary – Why, thank you! Love all the flowers and your beautiful room -thank you for sharing your home !! Stunning! Thanks for sharing your life with us! The room looks stunning! I don’t know that magazine but will have to see if. I can get my hands on one to see the photos. Still anxiously awaiting that cookbook. Being a sucker for any bird-themed design items, I am hitting the Command-Plus key to enlarge these photos just enough to further adore the wallpaper. Exquisite. How fortuitous to get that photoshoot reinstated. Apologetically, Spelling Police are asking if you mean Saponaria with an “N” (Soapwort) in the classic white pitcher? Your posts never fail to brighten my day. I made a second batch of the Lavender Shortbread Cookies, a second set of Rhubarb Parfaits (this time for company) and am poised to bake a Spiced Plum Cake from your recipe collection. Husband is apoplectic with glee. Hi Beverly – Yes, Saponaria with an “n.” Making the correction now. So glad you enjoy my recipes. I could use a rhubarb parfait right now! Gorgeous arrangements and the music room is one of the most impressive spaces I’ve had the pleasure of seeing. It was great to see you last week at the open house and it was so entertaining to see how the gardens have evolved. Bravo! Hi Margaret – It was great to see you again. Thanks so much for attending the tour! Just beautiful, you have a lovely home. Thanks for sharing with all of us! Stunning! When I toured your gardens a couple of years ago that wing was in serious disrepair. So glad you were able to restore it to such glorious splendor! While your home, gardens and food are fab, your whitty, conversational writing makes it real. Good stuff! Beautiful. What a compliment to be featured in a regional magazine! A picture of you would be nice. I love Victorian mass arrangements, and how convenient to have a talented, wonderful friend to create them for you! Lucky guy! I’m a hosta lover and with such varied leaves, they’re a great addition to arrangements. Enjoy the bounty of summer! Once again your post was wonderful. Flowers were beautiful. I will be making your blueberry bars this afternoon with fresh berries from my blueberry bushes. I acquired the bushes from a friend who moved into a new house and didn’t want the bushes. Wrong time of the year to transplant them, but had to take the chance in moving them or they would have been thrown away. They transplanted well and I was able to get a decent amount of blueberries. The photos of your beautiful home and flower arrangements were just stunning. Thanks so much for sharing them. So spacious and sunny- Modern Victorian- Drapery treatment is so posh! Thanks for the tour and the arrangements were perfect. Very nice! In the past, when I received flowers, sometimes I had hoped to copy the same arrangement with artificial flowers as to keep it for a long time. Lovely flowers. Lovely home. Lovely cat! House is gorgeous and the flower arrangements are stunning! The flowers are beautiful and your home is beautiful. It was nice to see Camille the cat show up in one of the pictures. Thanks for sharing the details of your photo shoot. Glad it turned out well. Your friend does beautiful flower arrangements. Beautiful, beautiful. Thanks for sharing. Thanks for the links to those there websites! Kevin, your home looks wonderful! So glad you were able to have another photographer come and all your preparation wasn’t wasted. I love the flowers, they add just the right touches. Also like that you used cuttings from your own garden. I have a smoke bush and would have never thought to use the branches in an arrangement. They are gorgeous. I perhaps would have thought of the asparagus fern, but never would have dawned on me to use hostas! My favorite touch though, that adds the “home” factor, is Camille! She is definitely showing her approval and I do believe she is claiming that particular arrangement for herself! I enjoy looking at your house. Always get inspiration and ideas. The flowers helped showcase each room beautifully. Hope you all have a wonderful Fourth weekend. Beautiful! Has your cookbook been published and I missed that? Your recipes have been the highlight of many of my dinners for friends! Thanks! Love your home. Such old world elegance! I love the way you’ve arranged the pianos so they (and their pianists) can speak to each other. Now that the cookbook is at (I hope) the printers, are you at work on another? A house and garden one would be a delight to pour through. Flowers are fireworks that we can have everyday!! In the house!! Good job on the house cleaning! If you need help, I know a lady…. Wow. So very beautiful. Brightens up my day. Love it. The house looks magnificent. You have done an amazing job of renovation and restoration. Give the Silver Fox a hug for me. Love, love, love! The cat is darling and brilliant job to ask for another photographer. Stunning~ and so pleased to see this gorgeous home turned into a magazine-worthy showplace. Kevin, you are one of the most inspiring bloggers in the whole, wide world! Refined taste, classy decor, and a great sense of humor…… You have it all. Kevin, Thank you for preserving ‘a kinder, gentler’ way of life. The flowers are beautiful. Thanks for taking the time and sharing your lovely home with us. Just love that ball room. Generations will appreciate the preservation. I know I do! I can live in a beautiful victorian, vicariously through your efforts. I need a SUE! Where can I find one on the Canadian side of NY state? OH, maybe your Sue will come here if the Donald wins. Eh? Beautiful arrangements Sue! Absolutely gorgeous!! I have never seen Saponaria. I am going to check it out here in Oklahoma. Your music room is beautiful. 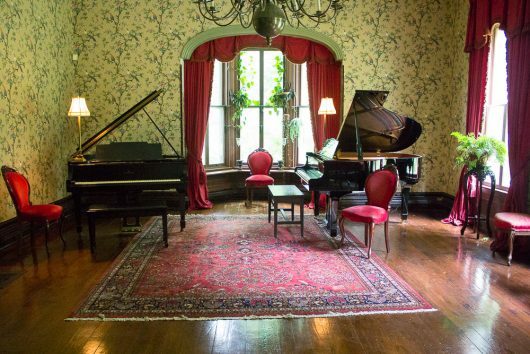 I can almost imagine sitting there enjoying a wonderful piano concerto in that room. Thank you for sharing your home. Am dying to see a picture of Silver Fox. Any chance? Kevin the flowers are just gorgeous, but so is Camille- I hope she gets her 15 minutes of fame as well! Love the pic with dear Camille! You are the best! Your wit and the beauty of your photos always make me smile, sometimes laugh out loud! Keep on keeping on! Your friend did a wonderful job on the arrangements, but to me, the simplest is the best. The saponaria is stunning caught in that beautiful light. Beautiful arrangements by Sue. The Saponaria is stunning!. Thanks for sharing your vintage home with us. Wow, do you often have concerts with the 2 grand pianos? You are indeed a person gifted with many talents… and using them well for others to enjoy. God bless you more. Love the smoke bush in the entrance hall arrangement. So mysterious! Nice cat, by the way. I can only reiterate what everyone else has said – just gorgeous! I grew up in lower NY state (although not in a fabulous house like yours – quite the contrary) and all your photos (especially outside) are very evocative for me. Thanks so much for sharing – I can’t imagine how you do all the things you do (washing 57 windows by yourself???) plus the recipes, garden, etc etc. So, all I have left to say is: where are the photos of you?? Please give the lovely Camille a ruffle for me. 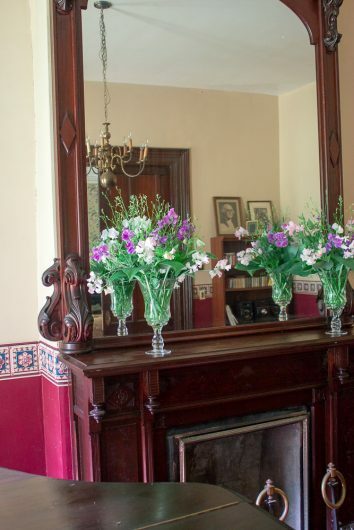 The flower arrangements were glorious, but those green draperies in the entrance hall photos are absolutely stunning!!! Beautiful arrangements. I can only enjoy the photos. Our cat Pierre loves to chew my plants. I got careless and brought home an arrangement of Carnations I made for my garden club. Cost us $400 dollars and trips to the vet. I have the poisonous plant sites bookmarked again. Love your newsletters. lovely home and beautiful flower arrangements. Sue is truly a gifted person and but I absolutely love your arrangement. Have you ever written about the beautiful wood floors in your home? They look absolutely gorgeous. How are they finished and what care do they require, please? Kevin, I am late in responding to you about your delicious Romaine soup. I have tried many wonderful recipes on your blog but this soup is by far my favorite; especially during our 100 + degree days! Just love your blog. You are so creative and clever. Awesome floral arrangements. Always delighted to view the interior of your home as well. The sweet peas are such a lovely addition to an arrangement. Beautiful home & flower arrangements. I, also, use sweet peas in my garden arrangements. Lots of Saponaria too. Holds up better than phlox in a vase. This year I am flooded with pink Malva, Blackeyed Susans, Lady Bells, Queen Anne’s lace, Persicaria Firetail, etc. Having a plant sale when I get them all potted up. I need my patio back again. My patio & gardens are like jungles this year. Plants are over 6′ tall. Usually 3-4′. Must have been the mild winter. Love your blog. So interesting & great pictures & recipes. 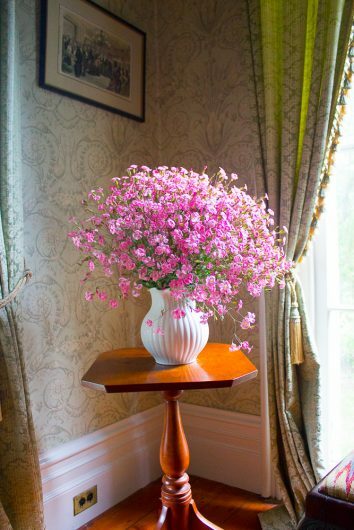 Flowers do dress up a room, even with rooms as beautiful as yours. Thank you for sharing your beautiful house. By the way I am Judy K’s friend, and I love your new website. Kevin….Yeah! Your new website is fab! Love the bigger pictures! The flowers……the nicest finishing touches on your beautiful home! O the flowers & the house are from Heaven! i have never ‘met’ or known of Saponaria before, but it is Lovely. I absolutely love & adore it and hope it will grow in mountain valleys with hot, hot summer days and icy winters…? -Or inside, and i will love it & talk to it every day! Dogs & i have been out dragging hay bales on an old-stubborn sled, thru the dirt pasture to the horses clear out yonder. We are going to buy a new wagon in a bit, & maybe a new wheel barrel cart-bucket farmer’s wife tool….You’ll believe me when i say that your Blog is the *Bright*Spot* of our day!?! cookbook you’ve written? Or do you have more I can buy in the meantime?